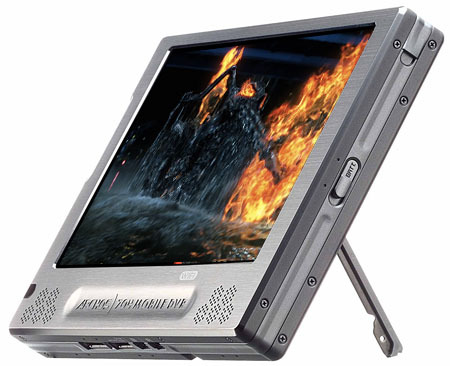 French media-player maker Archos has begun selling what it claims is the only handheld video player with a 7in display and wireless connectivity, all for just $550 (£286/€420). In addition to said 7in, 800 x 480 touchscreen display and 802.11b/g Wi-Fi, your money will get you 40GB or 80GB of hard drive storage and the ability to view and listen to a host of popular video, music and photo formats. It'll even display PDFs. The 704 has a USB 2.0 port to transfer content over from a PC or Mac - or direct from digital cameras and the like. 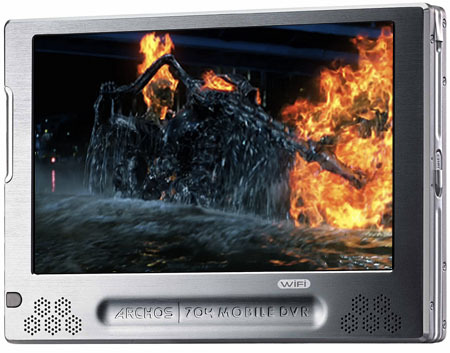 Video content can be grabbed using the optional DVR station digitiser - though Macrovision-protected movies will remain ungrabbable, Archos said. The removable battery delivers up to five-and-a-half hours' video playback and up to 25 hours' music listening, Archos claimed. All this in a unit 18.2 x 12.8 x 2cm and weighing 630g. Archos is taking orders for the 704 from today, but it's not sending the product out until the middle of the month.